Police and others at the Urban Assembly School for Wildlife Conservation, a middle and high school that shares a building with P.S. 67. MANHATTAN — The city is ratcheting up its efforts to curb bullying by dedicating $8 million for new prevention programs and making it easier for bullied students to transfer out of their schools, Department of Education officials announced Monday. The move comes after the recent stabbing at a Bronx high school, in which a student who said he had been bullied and frequently subjected to racial and homophobic taunts stabbed two of his classmates, killing one of them. The DOE has faced years of criticism over inadequate reporting of bullying incidents, including an audit from State Comptroller Thomas DiNapoli that found the DOE was not reporting hundreds of incidents as required under state law, as well as a report from Attorney General Eric Schneiderman that also cited the under-reporting of incidents. The money will be used to create community workshops on bullying prevention, provide more funding for student clubs such as Gender and Sexuality Alliances, expand mental health training, and create a “bullying complaint portal” for families that is expected to launch in 2019 to report incidents. It will also help the DOE implement a new protocol that requires schools to develop individual student action plans to address instances when a bullied student has several substantiated claims. Students who experience one or more incidents of bullying or harassment will be eligible to receive a transfer, and the DOE will work with the family to identify alternative placement options as soon as the transfer is requested, officials said. Approximately 20 students requested safety transfers from Wildlife Conservation after the fatal Bronx stabbing, the Daily News reported. The pro-charter-school group Families for Excellent Schools said even more needs to be done to comply with state and federal bullying laws, which is why the organization is a plaintiff in a class-action lawsuit against DOE, filed in April 2016, along with 23 parents whose children have experienced bullying and harassment in city schools. "It's long past time the city took steps to change what is a fundamentally broken system to address school bullying,” the group’s CEO Jeremiah Kittredge said in a statement. “This is what parents demanded more than 18 months ago when they filed a class-action lawsuit and called for specific actions that the city is announcing today, including safety transfers and the bullying complaint portal." As part of the new initiatives, starting in January the DOE will offer all school staffers a web-based interactive anti-bias training through Kognito, a New York-based health simulation company, in addition to anti-bias training conducted by the Anti-Defamation League for school employees. Parent coordinators will receive targeted training on topics such as creating a supportive environment, identifying bullying and supporting those involved in bullying, school officials said. The DOE is also planning to identify 300 schools with high bullying rates and target social-emotional support to train staff and help students with programs focused on self-awareness, self-management, social awareness, relationship skills and responsible decision making. ThriveNYC, led by First Lady Chirlane McCray, and the city’s health department will deliver Mental Health First Aid trainings and community workshops under the initiative. The trainings will cover a five-step action plan for assessing, identifying and offering assistance to students in crisis. The workshops will focus on LGBT supports, cyberbullying and religious tolerance, among other topics. 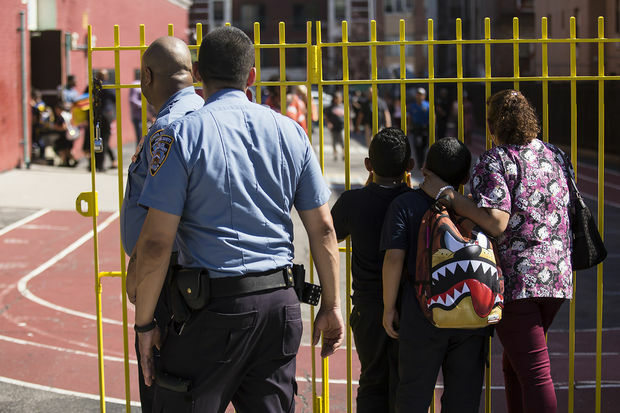 “We must work together to ensure that all school communities, particularly parents, are engaged as partners in this ongoing work," said Schools Chancellor Carmen Fariña in a statement. Experts have said it is critical for students who are bullied and their parents to have allies at their schools who they can talk to, which is why many advocates have been calling for more guidance counselors and social workers, while some principals have said they’d like to add more school aides to their rosters. For kids, especially, it is important that they feel known by at least one adult in the school, said Jed Lippard, head of the Bank Street School for Children and dean of children's programs at Bank Street College. “That is key. When a kid is experiencing crisis, an adult needs to be on the case,” he told DNAinfo.